Thursday 25th May 1978, and the start of a summer chasing 24s on passenger workings. Perhaps the start for some, of many summers on short trains behind rare locos along the North Wales Coast. And perhaps 2003 will be the last year this will be possible. 24082 stands at the head of 2D53, the 20:30 Crewe - Bangor, the last major leg of the diagram that started at 09:42 in Llandudno, with 6 Mark I coaches behind. Starting in mid-May, this working continued on Mondays to Fridays until 13th September. More info on the Why 2D53? page. 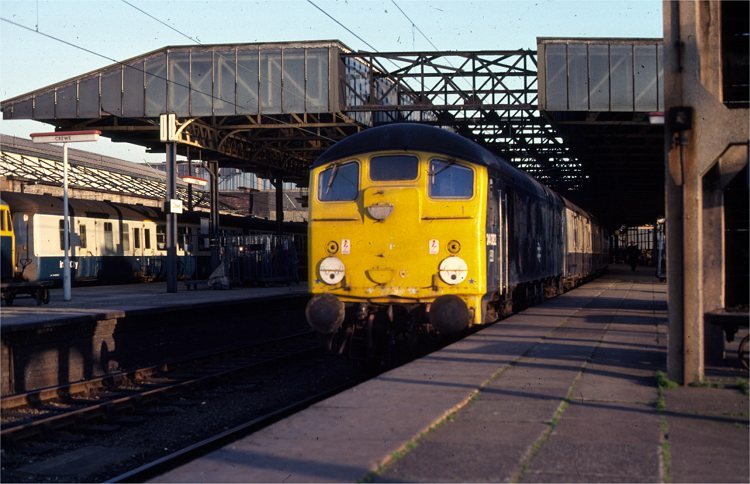 The train is in the old Platform 1A at Crewe, one of the north-facing bays that were taken out of use in the 1985 remodelling. This train replaced a DMU diagram, due to a shortage of DMUs (sound familiar? ), using spare coaches that would have stood idle at Llandudno Junction all week.